We so often get the opportunity to talk to you, our customers, and get valuable feedback on how the Growing Dome is performing for you. This feedback informs many of our product upgrades and improvements. Some of you living in especially cold, moist climates have reported a build-up of water and/or ice on the top plate of your foundation wall (at the base of your polycarbonate). 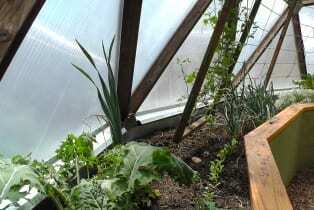 The temperature differential between the outside and inside of the greenhouse causes condensation on the inside of the polycarbonate glazing panels, which runs down the panels and onto the top plate. There can, at times, be enough condensation accumulate to have water or ice sitting on the top plate for prolonged periods of time. Over the years this can degrade your wood despite having the best wood treatment possible initially applied to the wood. This feedback from colder, humid climates inspired us to develop the Drip Edge Flashing and include it in every kit. 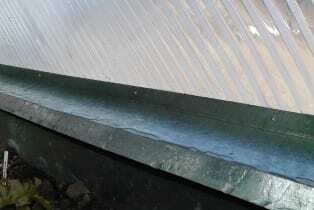 This flashing protects the wood on the top of your foundation wall from moisture and long-term degradation. As you can see in the photo, this custom cut and bent metal flashing installs right over your top plate. It is very easy to apply, we provide full instructions with a video.